Beth Dooley: Oh Asparagus! A Revelation! All my life, I've loved asparagus, first vegetable of the year! As a kid, we'd take the big clippers to cut the bright stems in my grandmother's garden, leaving some to burst into ferns that helped insure crops for future years. In a roiling kettle, they'd turn bright green, we'd drain and serve on a white linen napkin with a cruet of melted butter to dip on the side. My grandmother, devoted to Emily Post, allowed us to eat the stalks with our fingers. When grilling asparagus came into fashion, I gave it a go, but found it charred the spears to be tasteless; oven roasting turned them limp and dry. Then I discovered pan roasting. It's easy, it's fool-proof, it's quick. Seared off in butter or oil to keep them from sticking then covered to steam in their own juices, their flavors concentrate and caramelize. 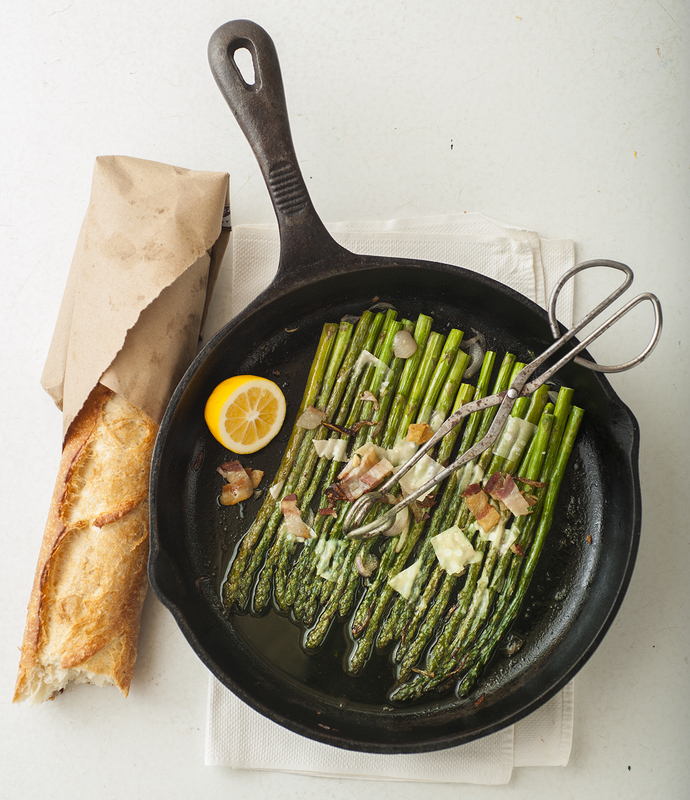 Pan roasted asparagus are meatier, more distinct versions of themselves. Gussied up with pancetta, Parmesan cheese and a squeeze of lemon, they are a pan-perfect spring meal. Good crusty bread is always nice. Set a large skillet over medium heat and add the olive oil or butter, pancetta and shallot. Cook until the pancetta has rendered most of its fat and is slightly crisp, about 3 minutes. Remove and set aside. Add the asparagus and toss to coat with the pan drippings. Cover, lower the heat slightly, and cook until the spears are tender, about 8 to 10 minutes. Remove the lid and continue cooking until the asparagus are slightly browned. Squeeze the lemon over the asparagus, season with salt and pepper, then top with the Parmesan and sprinkle the pancetta or bacon over all. Serve hot. Ooh, Beth, my mouth is watering — I can't wait for my frist taste of spring! A beautiful photo from Mette, too!